Singers Richard Perlmutter, lead vocals; Elin Carlson, soprano, Susan Boyd, alto; Jonathan Mack, tenor; Michael Geiger, bass. Plus various guest performers, including Ruby, Sammy, Nate, Michael and Julie Perlmutter. Orchestras The New London Orchestra, Bournemouth Sinfonietta, Slovak State Philharmonic Orchestra. Plus various guest performers and soloists. This is Perlmutter's first concept album. Each song features lyrics set to a well-known classical piece featuring one of sixteen different instruments. Included are the cello, flute, French horn, trumpet, trombone, clarinet, harp, timpani and English horn. And some instruments that people don't necessarily associate with classical music, like the mandolin. Highlights are "A Manly Man," a doo-wop style tribute to both the bass in the orchestra and the bass singer in Beethoven's Wig. And "Play My Song" about poor Beethoven's heartbreak when he dedicated his only "bluegrass" composition for mandolin to a young lady who would not play it. Also included are a series of extremely short songs - one only lasts 10 seconds – featuring the xylophone, harpsichord, and trombone. Beethoven's Wig 3 also contains the science fiction favorite, "Take Me To Your Leader," set to the famous theme from the movie "2001 A Space Odyssey." 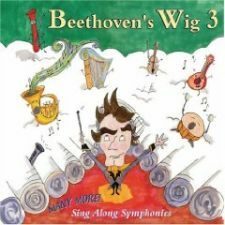 Beethoven's Wig 3 features vocal cameos by Perlmutter's three children and two of their cousins. In addition, Perlmutter's son Sammy did the cover art and booklet illustrations. And Perlmutter's brother Tom did the booklet layout and graphics! This album won Beethoven's Wig its third nomination for a Grammy Award for Best Music Album for Children. One reviewer summed it up, "A must have for parents who love classical music. It's honestly unique. I've never seen anything that compares with this amazing collection of songs for children."